Manos Tzanakakis, born May 31, 1965 in Athens, Greece. His first encounter with radio was in the early 90s in California, concurrently with studies in mass media and the music business in Fresno and San Francisco. His experience in the US, includes multicultural music programming and management for California State University radio KFSR 90.7, Fresno and more world music programming for US/Mexican public radio network Radio Bilingue. In 1995, upon returning to Greece, he established his name as a world music expert, with freelance work in several music magazines and newspapers and did import and promotional work for Athens world music label Libra Music. In addition, a year later, he entered the concert business, establishing world music agency Global Vision. In 2001 he set up the first greek world music station, KOSMOS 93.6fm for National Greek Radio, only to leave two years later, due to mainstream pressures in the period leading to the Olympic Games. He then set up Globalistas, a network of world music professionals involved in radio programming for various radio stations in Greece, as well as concerts and other multicultural events. In 2006, his Globalistas shows found a permanent home and complete artistic freedom at 105.5fm, Sto Kokkino, the radio station of the Synasmismos left wing political party, associated with the peace and ecology movements. His bookings and productions include Lila Downs, Ska Cubano, Stewart Copeland & La Notte Della Taranta, Abdelli, Ana Moura, Ojos de Brujo, Radio Tarifa, Maurice El Medioni, Femi Kuti, Milton Nascimento, Trio Mocoto, New York Salsa All Stars, Mercan Dede, Istanbul Oriental Ensemble, Gotan Project, Vinicio Capossela, Roy Paci, Simentera, Musafir, Bustan Abraham etc. 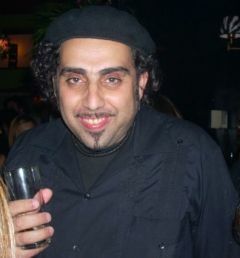 He has interviewed (press & on air), dozens of world music artists and has appeared as a specialist in various tv shows. As a dj, he has performed in various clubs, bars, concert halls and during the 2004 Olympic and Paralympic Games in Greece. Also in the U.S.A., U.K., Italy and Algeria. His current activities include, apart from the weekly show and music compiling for general rotation for 105.5, plenty of travelling, as music counsellor for Athens based music label and concert production company Ankh Music & Entertainment and international booking, in collaboration with Montpellier world music and jazz agency, Bacana.